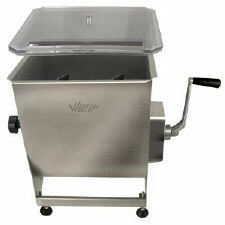 This Weston 44 LB Manual Meat Mixer is great for all meats, including game. The stainless steel mixing tub holds up to 44 lb of ground meat & seasonings. You can easily mix meat and seasonings for sausage or jerky. Mixer attaches to Weston #22 & #32 Electric Grinders.